From the moment Tottenham’s players left the pitch after their convincing 4-0 win over Huddersfield on Saturday, thoughts started to turn towards Wednesday night. A third straight win at their glistening new stadium was satisfying enough, but it felt like the warm-up act ahead of the main event that is facing Manchester City at the Etihad for a place in the Champions League semi-finals. And with a 1-0 lead to protect, Tottenham have an excellent chance of progressing. The most pressing question is: can they pull off a result without their talisman Harry Kane, who is expected to miss the rest of the season with an ankle injury? It was tough to draw concrete conclusions based on Saturday’s performance given Huddersfield’s flimsy resistance, but a breezy, energy-conserving display coupled with Lucas Moura’s hat-trick certainly bode well. There is also the heartening statistic that Spurs, who moved up to third with the victory, have won their past five matches without Kane. A recurring theme in those games has been the brilliance of Son Heung-min, who has scored nine goals in 10 matches with Kane absent this season. It was Son who scored the winner in last week’s first leg, and such is his importance that he was rested until the 87th minute against Huddersfield. Naturally he still found time to claim an assist, putting Moura through for his third goal with a defence-splitting pass. It has been quite the journey for Son, who three years ago told manager Mauricio Pochettino he wanted to leave after a difficult first season. Now, he is determined to repay those who stuck by him. Son also dismissed the idea that he would feel extra pressure in Kane’s absence. “No. I just enjoy the football. Everyone, not just me, should enjoy the game and scoring and winning,” he said. Son certainly seems to carry the burden of expectation easily, and there have been suggestions that he benefits from a more central role in Kane’s absence. City’s need for a goal on Wednesday could also mean they push forward and risk being exposed by Son and Moura’s pace. “We are going to probably have a lot of space to use so we need the attacking players to be ready to run and to give problems to their defence,” said Hugo Lloris, who, after Saturday’s clean sheet, is still to concede at Spurs’ new home. “They have different profiles (Moura and Son),” he added. “Of course we would prefer to have Harry, but every time the gaffer gives the chance to Lucas and Son they respond very well. 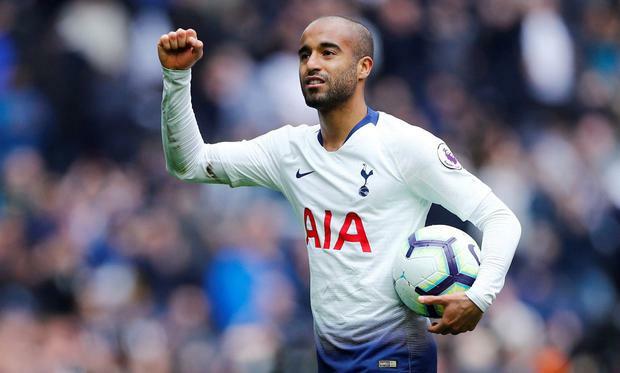 There could be even more onus on Moura and Son to deliver if midfielders Dele Alli and Harry Winks have not recovered from the hand and groin injuries that kept them out at the weekend. Victor Wanyama, who scored Spurs’ opener on Saturday, is another who may have to step up in the absence of Alli or Winks. Pochettino said: “It’s so important all of our players feel so comfortable, happy and fit with the trust they can compete and be an important part of the team. It makes us stronger. How Huddersfield must long for such confidence. Instead they have lost 19 of their past 21 league matches – a badge of dishonour to go alongside their record-equalling early relegation last month. Their lack of quality is such that the Championship looks like being a struggle next season, and with head coach Jan Siewert’s future uncertain, there is trepidation at what comes next.